Though KCR wanted TRS to get more than 100 seats, the party got 88 seats. 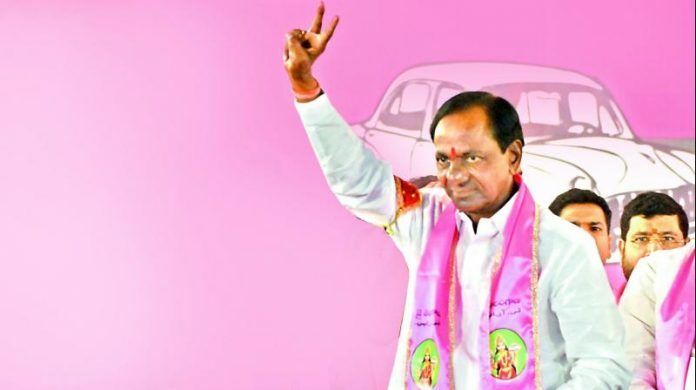 Hyderabad: The TRS has scored a century in the Assembly, a desire often expressed by Chief Minister K. Chandrasekhar Rao before the elections. Now, thanks to a series of defections, the TRS has reached the 100-mark. Before the Assembly elections, Mr Rao used to repeatedly say that the TRS would get more than 100 seats out of the 119 in the Assembly. The TRS ended up with 88 seats. The accrual of seats began almost immediately afterwards when legislators L. Ramulu Naik from Wyra (independent) and K. Chandar Patel from Ramagundam (Forward Bloc) joined the TRS, taking its strength to 90. The government renominated Mr Elvis Stephenson as the nominated MLA from the Anglo-Indian community, giving it the support of 91 legislators. After this eight Congress legislators and Telugu Desam MLA Sandra Venkata Veeraiah announced that they would join the TRS, some of them after meeting Mr Chandrasekhar Rao and the others after meeting party working president K.T. Rama Rao. The TRS can now count on 100 votes. The TD is now left with one legislator and the Congress 11. There are speculations that some more Congress MLAs may jump ship, among them are Mulugu MLA Dasari Anasuya (Seethakka) and Bhadrachalam MLA Podem Veeraiah. Previous articleA father asks PM: For how long will our sons fall prey to India-Pak standoff?